The D2 was introduced in 2162, this cruiser was little more than a glorified patrol ship fitted out with an inefficient, l fusion reactor and increased deuterium stores that allowed interstellar flight. Even with these modifications, the D2 required frequent refuelling between star systems. The cruising speed was warp 2.4. Once it reached its destination, the D2 was poorly manoeuvrable at sub-light speeds, again because of the bulk that resulted from the need to carry large quantities of fuel. This primitive design still bears a resemblance to the sleek, menacing Klingon cruisers of the later years. Command and control functions were already localized to a triangular head at the end of a short, rather wide neck. The rear engineering hull was surmounted by an ovoid impulse block flanked by plasma reflux tunnels with anterior ram scoops and exposed terminal flush vents. 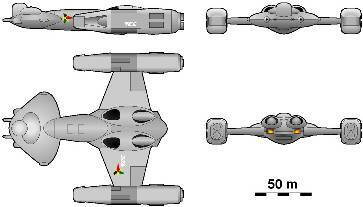 Extremely large nacelles stood out from the engineering hull on wide, deuterium-filled "wings."